The box is my attempt at making a home growing device that could actually fit everyone’s lifestyle and producing a product that is environmentally friendly throughout. Today, Grassroots Biotics launches its campaign on Kickstarter for The Secret Garden, an automated home grower for plants. Unlike other grow boxes that hide plants behind a single door box, The Secret Garden’s unique design gives users the option to add or remove side panels so that plants can be viewed from all angles and also provides easy access for tending to plants without having to remove them from the grower. “This will be the first of many green living products produced by Grassroots. The project began in my last semester at college while studying sustainable business. 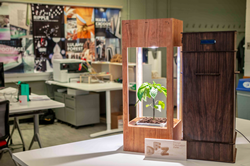 The box is my attempt at making a home growing device that could actually fit everyone’s lifestyle and producing a product that is environmentally friendly throughout,” said Founder Brian Hanna. The Secret Garden comes in two models: The Sensible model and The Secret Garden model. The Sensible model is available for those that have a hard time keeping houseplants alive and want to change that. This model does not include any side panel doors and is suitable for most houseplants and plants that bare fruit or flowers yearlong. The Secret Garden model comes with blackout panel doors that are sequenced to match to the rest of the box and suitable for when users want to control smells and grow specific plants such as carolina reapers or tomatoes. The lighting system consists of blue tinted side lighting that promotes the vegetative growth of plants and LED lighting that is optimized for flowers and fruit production. The Secret Garden comes with a customizable, efficient, auto-dimming system that dims the lights, providing users with a soft glow while at home. When users are not home, the lights are set to full power, ensuring that the plants are getting all of the light they need. The Secret Garden also has an electrical management system that ensures there is no wasted energy - it costs only $1- $2 a month in electricity. The Secret Garden uses an environmentally friendly, self-watering method that provides water and nutrients to a plant, based on that specific plant’s needs. The pot is adjustable, allowing for greater customization because some plants like drier soil, while some like wetter soil. The mobile app gives users 24-hour access to their Secret Garden’s temperature and humidity levels, as well as the height of their plant by using ultrasonic height detectors. It also provides users with reminders for water and nutrient refilling and tips to help specific plants grow. The app can also connect multiple Secret Gardens and compare different grows. The Secret Garden is available for preorder on Kickstarter starting at $279. For more information or to pre-order, visit pr.go2.fund/secretgarden. After struggling to grow several plants indoors, Founder Brian Hanna wanted to create something to help himself and others grow and maintain plants, vegetables and more from the comfort of inside a home. The Secret Garden is a versatile home grower that caters to a variety of growers and plants alike. For more information, visit https://www.grassrootbiotics.com/the-secret-garden.